Out this week on Toolroom Records, ‘10 Years Of SW4’ captures the very best of the festival's history and diversity with a selection of tracks from its most iconic artists, hand-picked by the organisers themselves. Having started as a backyard party in June 2001 and growing in number over the next couple of years, SW4 was born on Clapham Common in August 2004. The first ever headliners included Erick Morillo and Sasha, with an extra three stages of acts helping SW4 become a huge sellout. As the festival progressed the crowds increased and the line-ups grew bigger and stronger. In 2010, the festival turned from a one-day event into a two-day extravaganza with Carl Cox hosting the indoor arena. 2011 saw SW4 win DJ Mag's 'Best British Festival' award with headliners Pendulum and Underworld, and hosted sets from the likes of Magnetic Man, Above & Beyond, Richie Hawtin and Laurent Garnier. 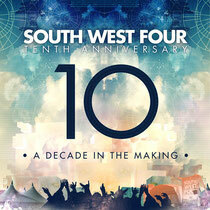 2013 is set to be the most iconic South West Four yet, with the biggest line up in the festival's history featuring UK-exclusive DJ sets, live shows, and back-to-backs from a selection of dance music's finest DJs and producers. '10 Years of SW4' features the very best of the last ten years with an eclectic mix of classics and fresh new favourites. Highlights include tracks from this year's headliners Armin van Buuren, Afrojack, Nicky Romero, Mark Knight, Eric Prydz, Adam Beyer, Steve Aoki, Groove Armada and Dillon Francis as well as a selection from past line ups including Fatboy Slim, Sub Focus, Pete Tong, SBTRKT, Maya Jane Coles, Layo & Bushwacka!, DJ Fresh, Redlight, Loco Dice, Wretch 32, Ferry Corsten, Delta Heavy, Ben Sims and M.A.N.D.Y. The album showcases a variety of electronic genres ranging from house, techno and trance to dubstep, electronica and D&B.